Combine one of the world's best digital assistants with a smartwatch that can actually stand by itself, and what do you get? The Omate TrueSmart powered by Nuance and Swype, which shows the rest of the smartwatch industry the direction it needs to go. Today's smartwatches have a problem: They need a smartphone. Untethered and unconnected, they're just barely functional. But if they're dependent on a phone, then the smartwatch becomes a $200 solution to the problem of taking your phone out of your pocket. Likewise, a phone without the requisite "smarts" simply pales in comparison to the smartphone. While the number of smartwatches available or planned appears to be close to a dozen or more, combining the right hardware and software appears limited to a select few. On the hardware front, Omate raised over $1 million for a chunky yet powerful smartwatch with an actual SIM inside that allows you to place phone calls and send texts, all-day battery life, GPS, up to a 8GB of on-watch storage, and Android 4.2.2 Jelly Bean. The watch is currently shipping to its backers. And on Tuesday, Nuance said that it would port its Dragon Mobile Assistant to the Omate platform, and demonstrated the technology, live on the TrueSmart, to PCWorld. What the companies showed off was simple, efficient, and effective: You can place calls, make calendar appointments, and perform searches, all by simply speaking to the watch. Given that this was a demonstration by Nuance, Sean Brown, senior director of innovation at the company, didn't spend a lot of time running through the capabilities of the TrueSmart besides Nuance. But if you buy in to the basic premise of a smartwatch--quick snippets of data, controlled by swipes and voice commands--chances are you won't be trying to browse the Web on your wrist anyway. "Send a text message to James Hendrix: 'Let's get together on Friday at 5 and jam.'" 'Send an email to Josh Light titled 'Proposal.' Let's meet over lunch tomorrow." "Post status: I'm having a great time in Las Vegas." "Create calendar appointment tomorrow at 7 PM." "How tall is the Empire State Building?" The phone's search technology is powered by Wolfram Alpha, Brown said. Nuance also built in Dragon Dashboard into the watch, providing an at-a-glance look at appointments on one's calendar, sports scores, stock prices, recommended restaurants (which factors in the user's location), weather, and more--simply by swiping. Like Google, Dragon learns your preferred searches over time and highlights that information, Brown said. Nuance also integrates with Gracenote for music identification, and with Philips' Hue API for controlling intelligent lighting, including the color. You can even buy music directly from the phone through the tiny yet "surprisingly functional" Web browser, Brown said. The smartwatch can perform turn-by-turn navigation, but only if maps are installed. "We have that functioning here," he said. And if you don't want to dictate texts and emails with your voice, there's Swype, the swipe-to-text entry system that's been a staple of most smartphones and was purchased by Nuance last year. For now, Nuance showed off Swype only on the Samsung Galaxy Gear--which, without the Nuance Dragon assistant, looked exceedingly basic by comparison. Nuance essentially hacked the Gear's notepad function to add Swype, which appeared to work quite well, using either English, Korean, or Chinese characters. The bad news is that the TrueSmart is the only smartwatch platform that Nuance runs on as of yet. But the company said Tuesday that it will use the Omate partnership to develop the market further with other vendors. What does all this mean? Well, for one thing, it's a challenge to Google: If it develops Google Glass to the exclusion of all else, the company may unwittingly cede the smartwatch market to its competitors. We can't say for certain what other gotchas lie beneath the aura of efficiency the TrueSmart exudes. 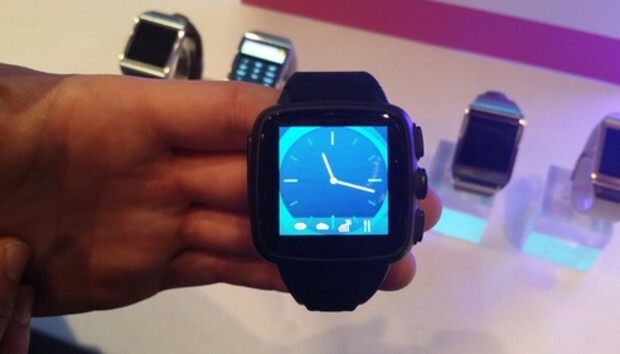 Omate's smartwatch is fairly clunky, a necessary evil to allow it to do the things it does. No, you can't play Angry Birds. Those are problems that can be solved over time. For now, though, it appears we finally have a smartwatch that does what a smartwatch should: stand alone and independent, and simply do what we ask of it.